In the entire world there is not one other fly that so easily travels the globe in the pursuit of fish, especially trout. This one amalgam of feather and thread on hook has been more places and caught more fish than anything else in the world’s flyboxes. Go anywhere else and you will see a rainbow of tyes for this fly. Not to mention variations that boggle the mind. One of which involves a 6/0 saltwater hook and enough chenille to cover a small sheep. The various Olives are king up here in Northern Maine for taking the Brookies and Browns that are abundant up here. Black is close second and looks so buggy that all of the catchable fish will hit it readily. (Tyed plain or with flashabou.) That extra sparkle to me seems to catch those hesitating fish. The flicker mimics a more natural look. Another variation that draws strikes and is excellent in faster water is the cone head versions. Try all the colors of the rainbow, but don’t go out without at least one brass headed olive. Now that’s a bass fly!!! A strange variation of the WB that thrives up here is a no-hackle fly called the “Maplesyrup”. It is a WB minus the palmered hackle. This also catches fish readily. But is usually only tyed in a “maplesyruppy” kind of amberish-brown chenille, with matching hackle fiber tail. The fly is a recent arrival so I attribute it to the adaptation of the WW or WB, but could predate it. Among the fly throwers I know we usually tie on a WB as the “Go To Fly”. It works in a hatch and out of one. But forget the risers, it targets the larger fish looking for larger food. I have consistently flicked it at the head of a pool and let it sink down to run out the other end. Then gotten hits on the second pass from fish too far back in the pool to be risers and also larger bodied than the mosquito eaters. What matters here is that nothing hits it the first time through. But it never escapes the second time. Everyone has his or her own favorite version of the WB. My personal favorite is a tandem version. It is in fact not two WB’s in a row, as I have seen elsewhere, but a true Maine Tandem Fly. The second hook is tied in upside down and smaller in size, and the tail section of the WB is tied on there. The whole fly is only 1/3 larger than a single hook version, but the tail moves a lot more as it is worked. I have tyed mine with both a wire leader and a mono one. The latter is my preference. It moves easier and I feel fools more fish than the shiny wire version. As far as I know nobody else is tying it quite this way but who knows somebody probably is, somewhere. 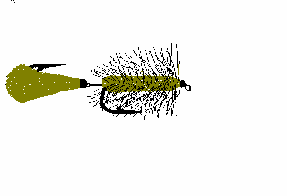 The fly is always tied in a weighted version to mimic the terrestrials of the deeper runs. (An unweighted version was previously tyed, “The Irresistible”. But nobody tried it in a tandem version. What would be the point, it already looks like dandelion seed on the water.) This tandem version just has more built in action and catches more fish in the heat than the drift fished regular version. I work it through the tails of pools in a typical “strip-strip-pause” cadence. I’m sure every tyer has his or her own version of this time honored fly. One thing is certain the Woolly Bugger will most likely remain in flyboxes for many more years. Each new generation of tyer will try to create the newest best version. In the end it all comes down to the fact that the WB will catch fish now and forever, as long as we continue to tie it on. So if you know a fisherman and want to get him flies for Christmas or a birthday. Just go to the local fly shop or online and buy him a selection of flies in the #4 to #10 range in every available color and material variation. There would be a few hundred flies that all catch fish! What more could a fly man want?